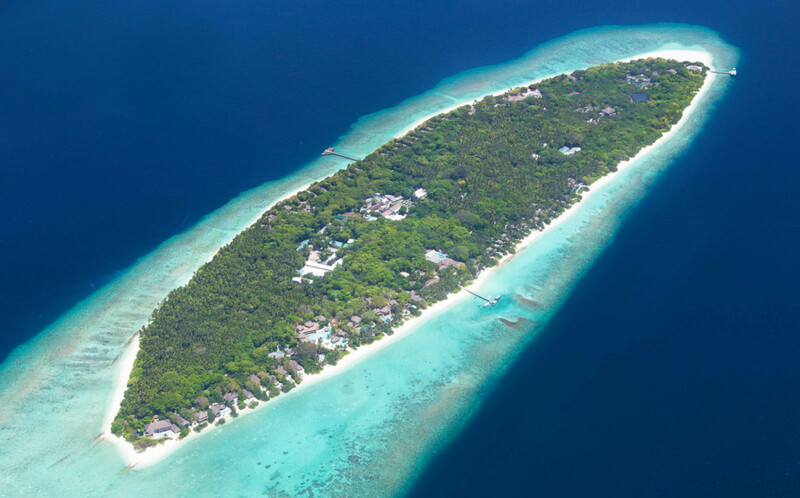 Soneva Fushi - An Island you would love to be shipwrecked on...forever! Soneva Fushi – An Island you would love to be shipwrecked on…forever! Have you ever dreamed of what it feels like to be a castaway, on a remote tropical island, with swaying palm trees, the sound of waves, and Man Friday for company? As a child, I loved Daniel Defoe’s book, ‘Robinson Crusoe’. And I was one of those dreamers, who always wondered what it must have felt like to be shipwrecked on a desert island. Forty years later, my dream came true. Thankfully, Laveena and I were not shipwrecked, nor were we made to feel like castaways. 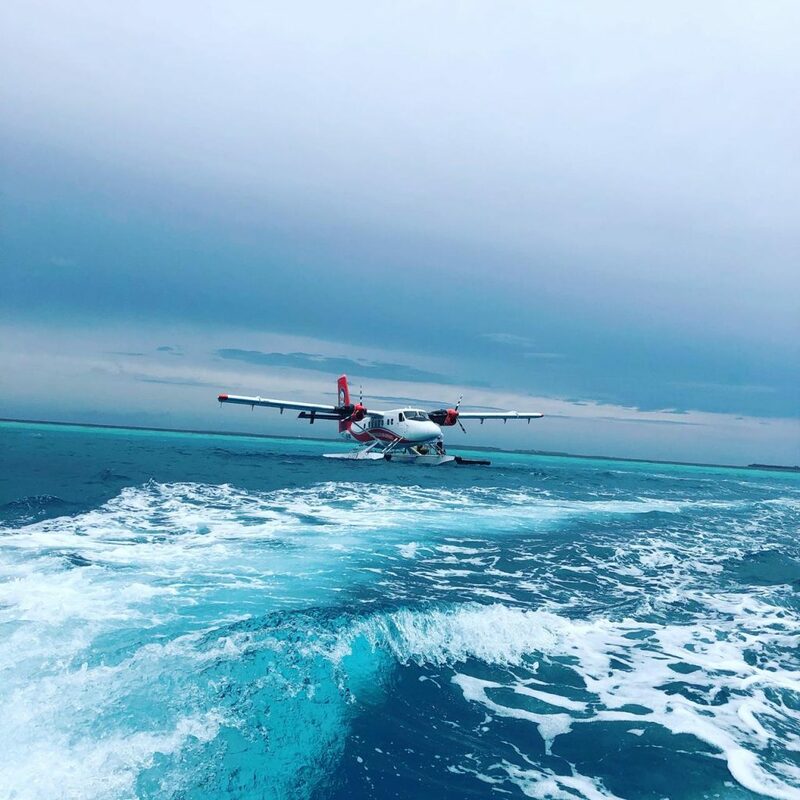 But yes, the island which was a scenic 30 minute sea-plane ride from Male, was remote, tropical, with swaying palm trees and the gentle and calming sound of waves. Located in the Baa Atoll, in the Maldives, Soneva Fushi, is an eco-friendly, uber luxury and chic getaway, where you do not encounter mutineers, captives and cannibals like Robinson Crusoe did, but you do have a very attentive, Ms/Man Friday, your private butler, who attends to your every little wish. Our Ms Friday, the wonderful and always smiling young, Yasmin, welcomed us to Soneva Fushi with genuine warmth and enthusiasm. She handed us cold towels, with which we wiped away the gritty dust of city life. 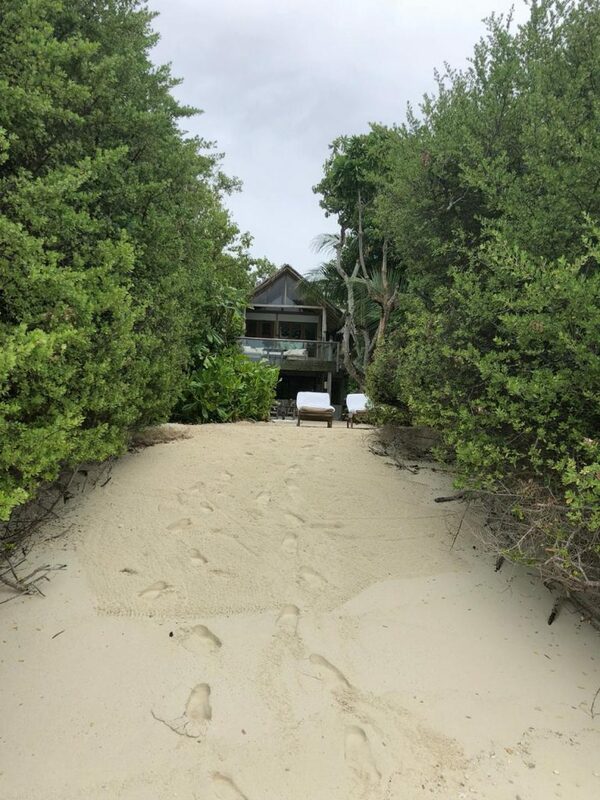 Yasmin also reminded us of the ‘no news, no shoes’ policy, followed at Soneva. We happily complied, waiting to embrace that unique feeling of ‘barefoot luxury’ as our feet touched the sand and we walked to our palatial, two bedroom, thatched roof, villa #6, located on the white sand beach on the sun-rise side of the island. The villa itself had the unique and distinct touches, other Soneva properties are known for, with a very easy, rustic, eco, yet luxurious feel to it. 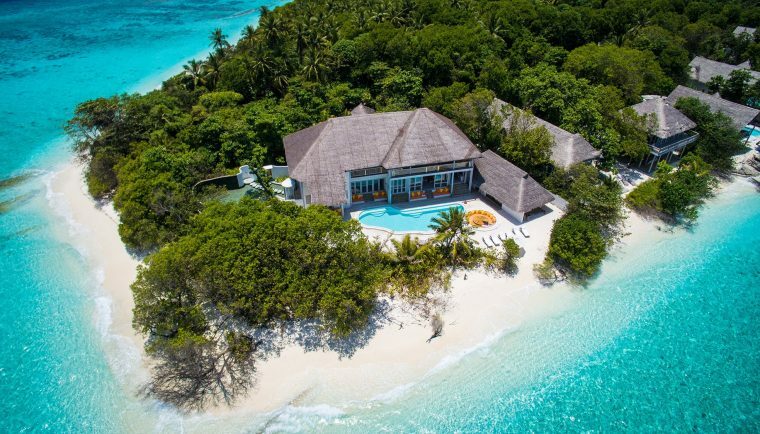 Blending effortlessly into the densely forested 100 acre island, each of the 65 villas on the island are known to offer extreme privacy, quietly tucked away from any visible civilisation. 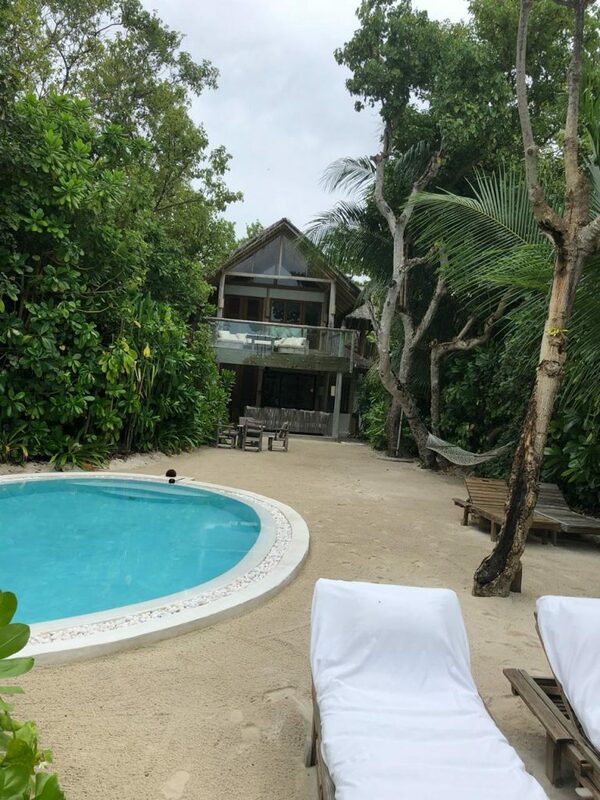 What Laveena loved most about our villa, was the fact that it had it’s own private pool, a private gym and its own direct access to a quiet secluded part of the pristinely beautiful white and powdery sand beach. For me, it was all that and more, especially the elaborate garden master bathroom, with a wonderful sunken tub, which one could only access by walking across flat stone blocks laid evenly in a water body fed by a waterfall. Each time we soaked in our outdoor tub, underneath the open sky and inhaled the intoxicating jungle aromas, we felt consumed by an exhilarating sense of surrendering to nature, to the sounds of mating insects and to extreme freedom. 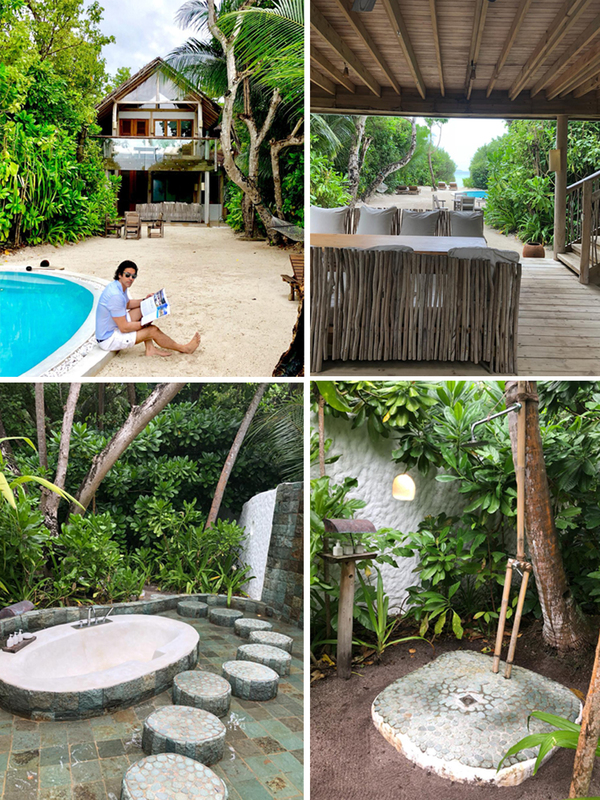 A few times during our brief 5 day stay on the island, we would use a second outdoor shower, also part of the master bathroom, tucked away deep in the lush foliage, surrounded by a high wall which ensured and protected our privacy. 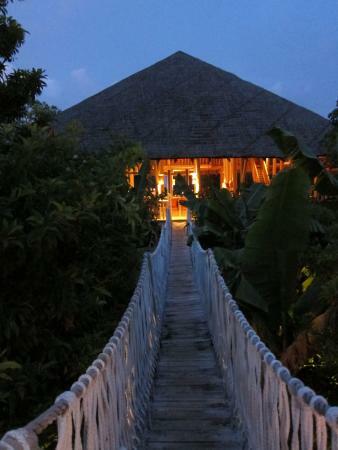 On our first night at this resort paradise, Laveena and I cycled to ‘Fresh in the Garden’, a restaurant without walls, which we accessed, by crossing a rope bridge, built over the resort’s organic herb and vegetable garden. 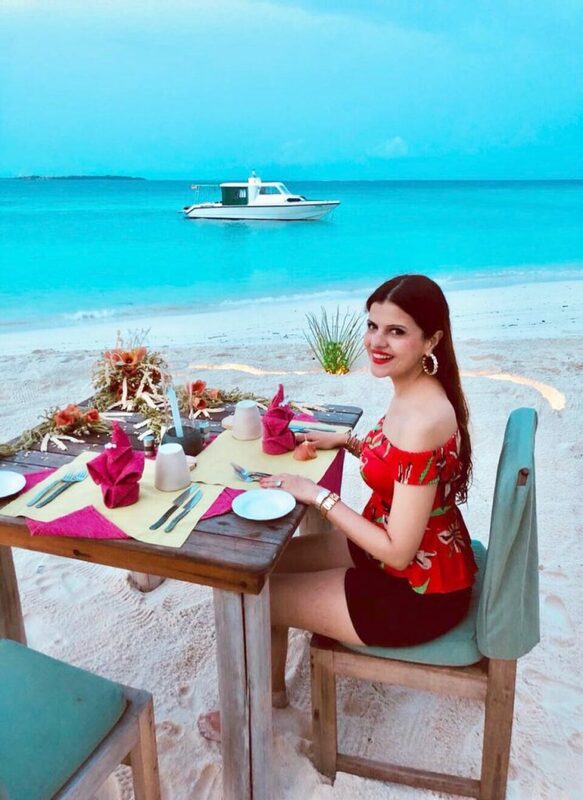 Nimal attended to our table that evening and his recommendations perfectly complimented the French Bordeaux and the tantalising aromas that the gentle sea breeze carried with it from the herb garden below. After a delicious dinner, we cycled back to our villa and almost immediately stepped out onto the beach for a late evening walk. It was quiet and peaceful and we couldn’t see another living being in sight. As we walked, hand in hand, Laveena and I felt calmed by the gentle sounds of the breaking waves against the damp, cool sand. At one point I remember, staring into the clear sky, at the countless stars which shone brightly in their stately divine constellations. Laveena recommended we call Yasmin, our Ms Friday, to help us arrange a visit to the Observatory at the resort. The very lovely Laisa, who is not only the FnB co-ordinator at Soneva Fushi, but also the in-house astronomer, was waiting to welcome us when we got there. Enthusiastic and eager for us to discover the mysteries of the cosmos, she invited us to peer through the lens of a state-of-the-art telescope. 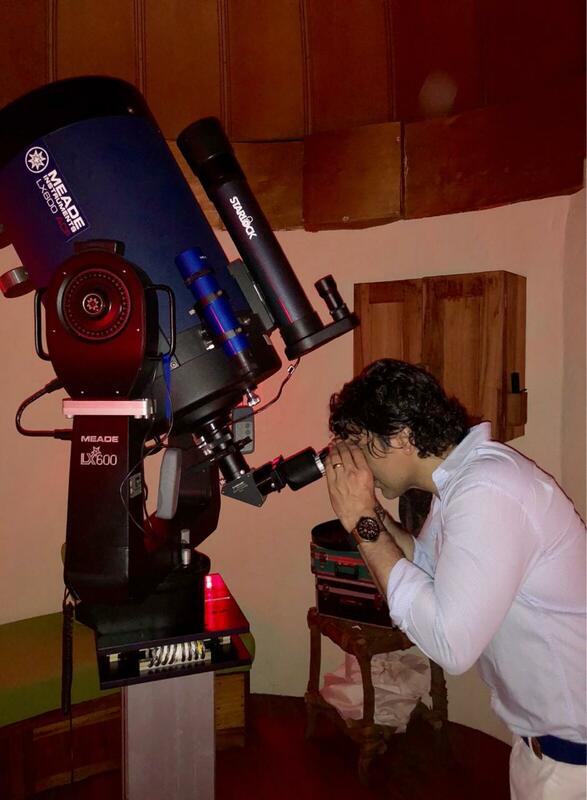 We gaped in amazement as our eyes came to rest on the innumerable moons of Jupiter. We stared in wonder at the Plough of Saturn with it’s translucent curves and we reached out to touch the craters of the bright moon which looked like an uninhabited piece of barren white land. Laisa proudly informed us that Soneva Fushi was the first resort in the world to introduce 3D astronomy to its guests and both Laveena and I felt immensely privileged to have experienced a tiny part of history. At breakfast the next morning we were lucky to have met Kenji Gyoten, the decorated Micheline starred Sushi Chef from Japan. He was at Soneva Fushi on the invitation of the resort. 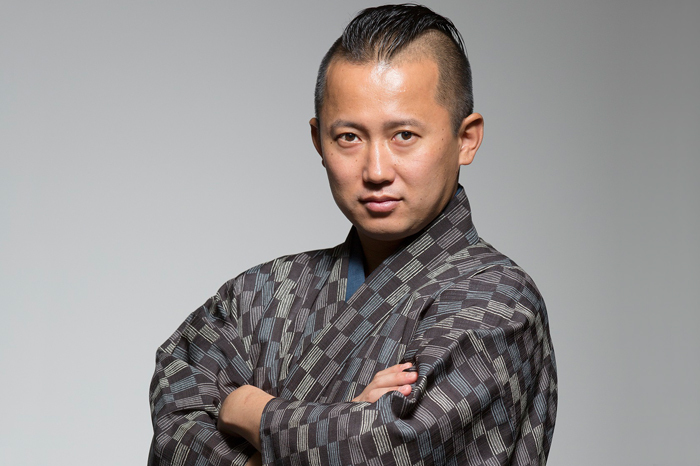 For those who haven’t met Kenji san, he is the youngest three star Micheline star chef in all of Japan and his restaurant in Fukuoka, is known to have a six-month waiting list. In fact, he said to us that his mother jokingly once asked him whether he would seat her at his table, had she dropped in without a booking, to which he replied that she too would have to wait to experience his wizardry at his restaurant, ‘Sushi Gyoten’. Kenji san enjoyed his conversation with us so very much that he joined us at our breakfast table and when we were finished, he invited us to ‘Out Of the Blue’ that afternoon to enjoy his culinary craftsmanship. We felt privileged and lucky with the personal invite and couldn’t wait to see him use the ‘hontengaeshi’ (hand flip) technique, he is so well known and respected for. When we arrived at Out Of the Blue, we loved how the wooden structure mimicked natures gentle curves, with its free form design and how it stood out against the azure blue waters of the Baa Atoll. We couldn’t believe our eyes when we got to lunch, as we literally had front row seats for a soon to begin Omasake theatre experience conducted by Master Chef Kenji Gyoten. He was sporting a plain, dark brown kimono, which he wore with his sleeves tied back. This he said was very typical of his unique style as he ensured that the sleeves would not interfere with his hands and his knife work. Over the next 3 hours, Chef Gyoten, performed his magic with an easy flair of passion and amazing technique. He transported us so effortlessly to sushi heaven. With fish sourced from the renowned Tsukiji fish market in Tokyo and with a unique flavoured rice from a region in Kyushu, Japan, each of the ’tsumami’ appetisers and 12 sushi bites we were treated to, were relished with our eyes closed and our senses focussed. The sushi was made with carefully selected ingredients, akazu (red vinegar) and with ample expertise, reflective of a true master. 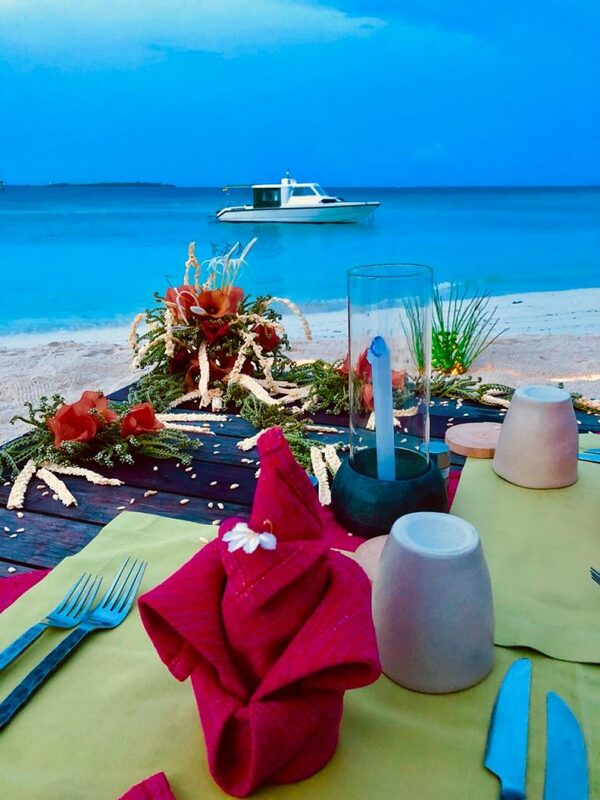 One of the dinners we had was on Soneva Fushi’s private sand-bank. Underneath the star-speckled sky, a beautifully decorated table was set up for us and we were treated to an evening which was not only immensely romantic and celestial, it gave a whole new meaning to a ‘table for two’. Sitting in that space dedicated only to us, with our bare-feet on the cool sand below us and surrounded by the calm ocean on all sides, our imaginations were pampered and as we dreamed up what we may be treated to next, the staff from Soneva Fushi served up different meal courses to the accompaniment of a truly fine, perfectly chilled Pinot Noir. The sandbank was our private space, a place without rules, a playground for two lovers who at that moment felt nothing but extreme gratitude for experiencing the closest thing to heaven on earth. Our lunches were always a treat at Mihiree Mitha which in Dhivehi means “here it is”. The buffet at Mihiree Mitha was elaborate, with a wide variety of cuisines to choose from. A staple during our stay at Soneva Fushi, were the super fresh and delicious organic salads. While on day one, we feasted on Italian Pasta, day 2 was about Awadhi cuisine which not only included mouthwateringly tasty chicken tikka from Lucknow but also flaky tandoor rotis and curries which made us lick our fingers clean. Once on our lunch menu was a thin and crispy wood fired pizza with all our favourite toppings. We would wash all of our meals down with tasty cocktails, chilled coconut water and scoops of different flavoured ice creams. A daily ritual of ours was to visit the three dedicated rooms for chocolate, ice cream and cheese. At different times of the day, Laveena and I would walk over to feast on the wide array of delicious cheeses and ice creams. The feeling of walking barefoot into a chilled room and having trays of decadently delicious chocolate treats before you, is so hard to describe. All I can say is that the same look of glee, one saw on the eager faces of the children at the resort when they were choosing their favourite flavours in the chocolate room, were seen on the faces of all the adults. The next few days Laveena and I spent enjoying the fabulous resort. What stood out for us, were the active eco programmes on-site, including filtering, mineralising and bottling of Soneva Fushi’s own drinking water, recycling 90 % of waste onsite through a robust waste management strategy and composting left over food from on-site restaurants to create valuable and nutritious soil for the in-house vegetable gardens. 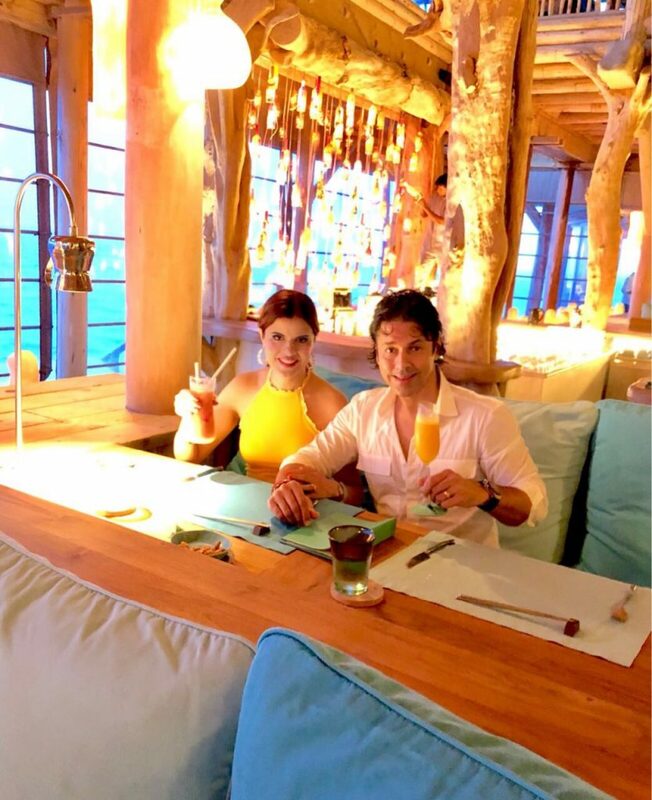 Our Ms. Friday, Yasmin, even informed us that the wine bottles, not only from Soneva Fushi, but from other neighbouring resorts, were sent to the Soneva Glass Studio where they were turned into stunning works of art. There is so much to do at this fabulous resort. The time we spent at the island was too short. The day we were leaving, we bumped into a couple from England, who said they returned to Soneva Fushi every year and spent a minimum of a month at this dream pristine paradise. They said they loved everything about the resort, especially how the staff were like their family and how they were made to feel so much at home while on the island. Before we headed to our sea plane ride back to Male’, both Laveena and I agreed, that we too would like to return to Soneva Fushi with a plan to spend a minimum of a fortnight, discovering the many wonderful experiences the resort had to offer. Wow I really went on a virtual trip! The pics are amazing and the place looks super fun! The place looks so beautiful. I can see why you would want to get lost in this place – so serene, green and a place to be one with nature. This was a fantastic experience. Loved each and every photograph. Seems like you guys had a blast. I am going to experience this place and property in future. Thanks for providing a new destination goal. Your evocative description of your stay at Soneva Fushi, has brought back vivid memories of my own honeymoon in Velassaru island of Maldives. Truly Maldives is paradise on earth! This is such a great descriptive and amazing post…Loved reading this and enjoyed a lot … Look like you had a great vacation!! This was such a luxurious read & i can not tell you how much I’m waiting to visit this island. Love the descriptive details & the post! Thank you very much 🙂 Glad you enjoyed it. 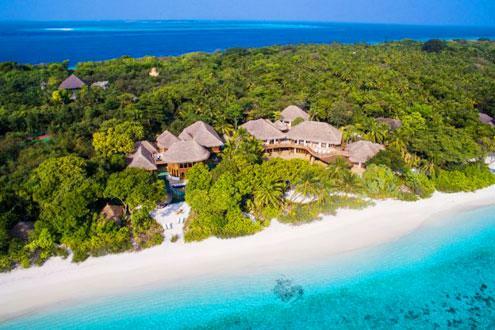 Soneva Fushi is a true heaven on earth which should be enjoyed once in a lifetime. I like the villa opening to a private beach and having a pool for yourself. The calm atmosphere is what we miss in urban cities. That was absolute wow!! How amazing it can be to have a private villa with pool and a small portion of beach. Amazing panperment , loved every image, far away from the civilized world. Your post transported me there! How beautiful is the villa and that blue sea calms you instantly. Wow! The island is so pretty. I loved all the pictures and you look lovely too. I am sure it must have been a great experience and you created lifetime memories. The blue sea and the soothing pictures makes my nerves calm. The place is just heaven and perfect for holidaying. Would love to visit once. I just cannot get over this! How beautiful is the place! The villa, the sand, the pool and the time and experience with Kenji san! You really had a great time! Such a beautifully written detailed post. Seemed like we were on a virtual tour with you to the island and experiencing it with you. Shall add this to my bucket list. What a lovely trip to nature’s lap. Love the tranquility of water, so blue that is. your images are amazing, and have explained it brilliantly. Add your email ID and embark on an adventure with over 50,000 like-minded travel lovers.